Ten years ago today, Lucid became the first genuine absinthe to gain approval for legal distribution in the U.S. since it was banned in 1912. Lucid creator T. A. Breaux negotiated approval to import the spirit by proving that his finished product fell well under the U.S. Alcohol and Tobacco Tax and Trade Bureau’s limits on the presense of Thujone in spirits. Thujone is a chemical compund found in wormwood which in the past was blamed for Absinthe’s purportedly hallucenogenic effects. In reality, Absinthe’s bad reputation probably owes more to the temperance movement and early twentieth century winemakers, the latter of whom opposed its negative effects on their wallets. Both groups maligned the spirit, which had grown wildly popular in France in the late nineteenth century. Their enthusiasm for the spirit they called La Fee Verte, which translates to The Green Fairy, spread internationally, with The Old Absinthe House bar on Bourbon Street in New Orleans being its premier emissary stateside. 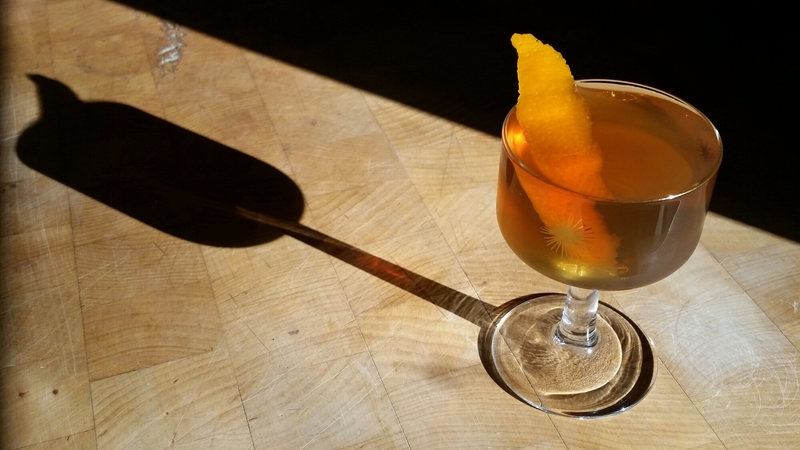 The Sazerac is probably the best known cocktail using absinthe, but, like the Corpse Reviver No. 2, it is only used as a wash. I aim to create a cocktail that allows absinthe a more prominent role. I start by messing around with gin, quinquina and Peychaud’s Bitters. My first attempt is so terrible that I abandon it in favor of rye. I mix one ounce each of Rock Creek Rye and Dolin Sweet Vermouth with a half ounce each of Absente Absinthe and Stirrings Ginger Liqueur and three dashes of Angostura Bitters. Anise and ginger play well together, and absinthe benefits from the sweetness of the liqueur and the vermouth. It needs a little acid, so a stir in 1/4 teaspoon apple cider vinegar, taste it, and add a 1/4 teaspoon more. That does it. Since tin is the traditional gift for tenth anniversaries, I’ve called it a Tin Fairy. Anise is still a taste I’m acquiring, so anytime I use it, I have to strike a balance, and the Tin Fairy allows absinthe to shine without overshadowing. The history of absinthe is instructive. Now more than ever, it’s a good reminder of how special interest groups can use rumor to change laws and how those “alternative facts” can be repeated enough that, a century later, many people still believe them.